I done did a "First Impression" write-up of this Isabela offering HERE. Lettuce see what some settling in the ol' humi done did do. This'll be a nice smiley recoup of energies spent weeding my yard to no good end. I mean I ain't about to farm anything, gentlepersons. 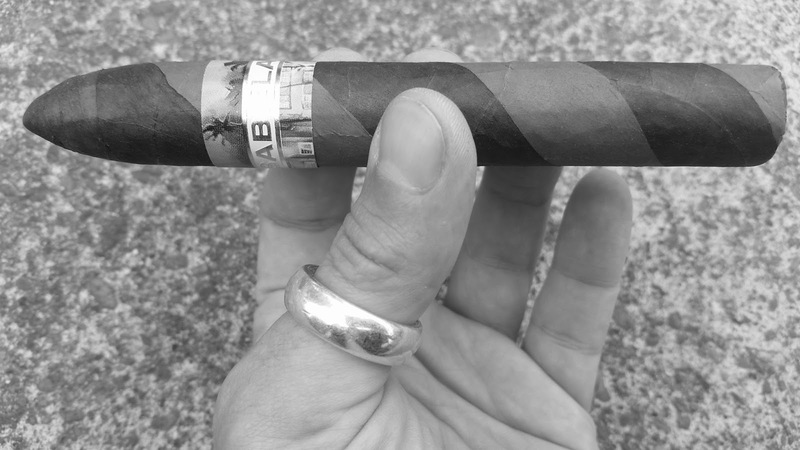 A Belicoso barber-pole? That's two things I ain't huge on. Why must I suffer so? Big shout-out to Johnny over at Isabela for this sampling. Complexion-wise the Maduro looks awfully Maduro as does the Connecticut look awfully Connecticut. Weird. I had no idea I was in a cranky mood. Both colors have a goldenrod under-belly with a slight soft green hue. Veins, but nothing larger than a spider web, though one web doth crimp at 2/3's start. Cap is nicely affixed. Foot tobacco is packed to an eye-balled medium+ density and is vastly an auburn. Slight bits of highlights are there in dirty blonde, and low-lights, in a soft brunette. A soft brunette would surely help with my mood, gentlepersons. There's a nice oily sheen atop. Hand-feel is a tick toward light, but not light. Balance is commendable for this format. No soft-spots are revealed on the Charmin Squeeze testing, which yields a medium+ pinch density. Lively spring-back. Nice oils on the shaft are transferred to my mitt. Mainly a smooth top-leaf with minimal snag. A shaved peach with a singular crimped vein, tiny. Schnozzing the wrapper, I get produce section, blanched nuts, meadow, and cigar. Some white pepper and a neat fruity sweetness is at the foot. Sugar is used here to affix the cap. It's a traditional Cuban roller technique. The problem I have is do I put the Xikar clipped cap in my rose food bucket, or not? I don't. Better safe than sorry. Draw tension is a medium+.Notes on the cold tug are presented on an underbelly of sunlit earth schmeared with almond paste and are produce section peppers just nosed out at the line by vanilla. White pepper and some fruit from the cold middling. Foot toasts at a nice rate and evenly so, even as I sit outside and dare employ a wooden match in lieu of some lightsabre thing. First hot pull is the same tension as cold and delivers notes of jalapeno and vanilla up-top. Underneath in the middling is pale fruit cocktail syrup and white pepper. Underneath that: almond paste schmeared over sunlit dirt. Did I say all that already? Coulda just said the first hottie is a lot like the cold one. I can't help but wonder why my readership keeps upping, but thanks nonetheless, Dear Reader. Second hot draw is retro-haled produce peppers and a bunch a' dems... drops to palate as fruit syrup. Vanilla is on my tongue. Sunlit dirt underneath the almond paste schmearing is post heavy rain. It permeates upwards through the profile. Third hottie has an exotic floral note addition and we are off to the races, gentlepersons. Burn is the slightest tick wavered but has already shown to be self-correcting. Line is thin. Ash is vastly pale grey with some silver and a bit of charcoal loosely woven in. Packing did not soften a singular iota off lighting. Draw is plugging along and easily satiating my smoke-hole. Finish tastes like yellow and has medium+ length'd gams. Foot-smoke is copious and is a light aromatic tobacco with vanilla sweetness and a citrus backing. Citrus comes up on draw now, too. It's an orange mint note and puts on a lil show. Very nice. Mouth-feel non-dairy creams up on the back of vanilla. I'm a half inch in, and still taste sugar, but lesser so, and I dug it at its most-er so. Profile is a boundary pushing medium. Strength is low+ but moving. Peppers are jalapeno, habanero, and banana. This Serpentine is really a trip. Ash is a flake-free sheath. Pace is slow, languid, but not boring. Burn chugs along near dead-even on a now -medium line. Draw might be a tick more resistant, but smoke-hole is filled, yup. Pecan flows into mid-middlings. A bit of top-leaf don't wanna burn, so I roll off an inch and a half of solid ash into my $0.99 Walmart tray. Perhaps it'll self-correct sans insulation. Remaining sugar seems to attach to and candy up the pecan. Some oak comes in, lively so, as in alive. Ash gets a bit of brown hue. Flavors are: Produce peppers, vanilla, white pepper, fruit syrup, candied pecan, orange mint, oak, hibiscus. In that order-ish. Exotic, no? I kinda taste papaya. Burn is self correcting as I type. Profile has stretched over into the medium+ realm. Strength is up to a -medium. Room-note is unchanged from my previous prattling, as is draw and input/output. Construction holds firm, combustion decent and then-some. Just truckin' along here, gentlepersons. Wanna know why I don't make friends? I was walking Ruby Vondella the other day, through the park across the street, when a big and unleashed mutt ran at us. I picked up my belove'd doxie and waited for the big mutt's owner to come over. He didn't. I had to call him over. I did so nicely 'nuff. He didn't come over. "He's friendly." He said from the same 20 yards away. "I'm not looking to make friends," I said. "Get your dog." I might've used an off-color adjective for "dog." Hard to recall. Well, the owner finally saunters over and I thank him. I also recommend a leash. "Leash" might've also had an off-color adjective attachment. Hard to recall. The poor fella was so upset, he had to leave the park. I roll off another inch of ash. Isabella makes me aware of something. I like a stick that makes me laugh, tell stories. It does that. Across its line. Anyone wanna chat? Cayenne pepper powder comes on-board and a tingle sets in my lips and cheeks, nicely. The fruit syrup is moving toward a sweet white wine. Mint is more minty in the orange mint note. Far-away, a blonde roasted coffee is occuring. Combustion/construction are unchanged. Burn-line is nigh dead-even all on its lonesome. Not an easy vitola to say that in regards to. Not an easy format, either. Belicoso and barber-pole, respectively. I need to host a Kibbitz with one a' these. Thanks to Mr. Piette, I got a bunch. Strength and profile are at medium+ each, but the strength is wine-drunk, not booze-drunk. I'm no boozehound, but I am a lil bit of a wino -- as long as it's kosher. I wonder if the sugar makes this offering more kosher than other gluing methods. I'll ask my rabbi. Some toasted caramel comes in from under the vanilla. Orange blossom honey comes in to pull up the light aromatic tobacco note. Very pretty. Some white bread. 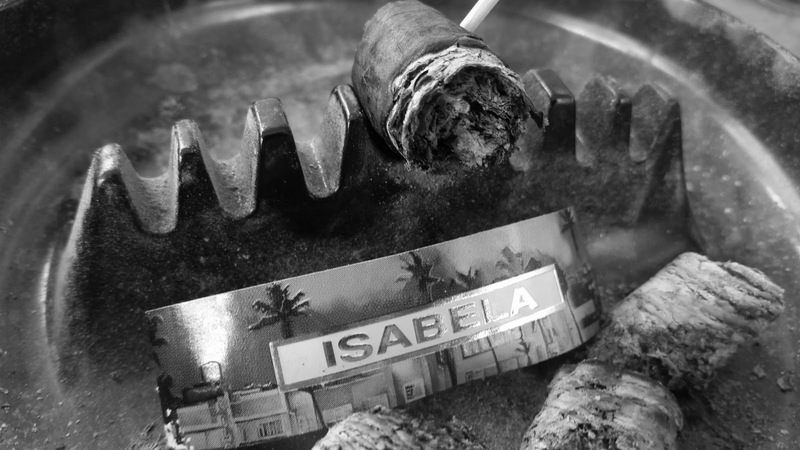 Gentlepersons, try Isabella. I've sampled their Churchill, Corona, and Firecracker. Look for them in my Cigar Review index. Ya can't go wrong, I sez. Strength just hit a sudden -full and I can't type any longer. Can still chat if ya's like. (541) 953-8589. No dummies, please. Fun. Different. Get one. Smoke one. Any Manischewitz, from Loganberry to Blackberry. Chai tea or frou-frou coffee drink.